A very good news now coming for those who want fill application form for the latest Samvida Safai Karmi vacancy in nagar palika parishad. now district magistrate / jiladhikari DM office started publishing the official recruitment Notification for the filling posts of Safai Karmi . All eligible candidates who hold the eligibility criteria they can fill application form in prescribe application form proforma. This recruitment will be completed under the rules and regulation of Shasanadesh h GO of 2021/9-1-16-185/10 TC dated 04/07/2016 of nagar Vikas vibhag anubhag 1 . Cast certificate: must be attached by the applicant which will be issued by Tehsil. Selection procedure: selection of the eligible candidates will be based on through the personal interview test. Selection of the eligible candidates will be based on contract basic. 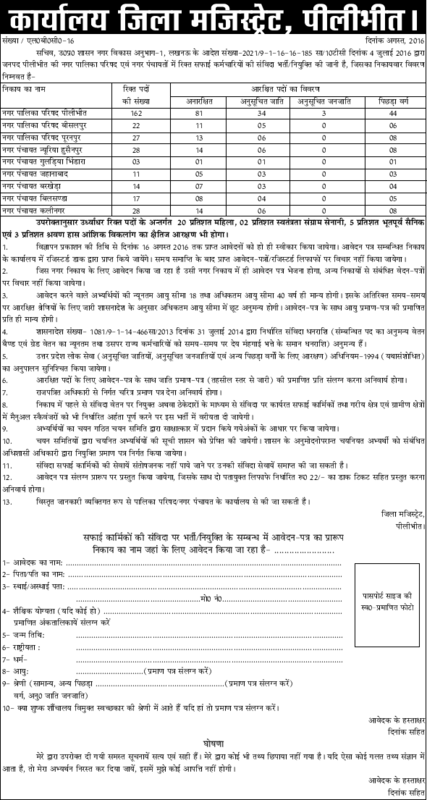 How to apply : eligible candidates can fill application form in prescribed application form format which is published by DM office by Pratapgarh. Last date of application form submission is 10 days from the date of publishing official recruitment notification. After filling application form send the dully filled application form to cocnered Nikay office through Registered or speed posts of Directly. Attach two envelop affixed with postal stamp ticket. Last date of application form submission – 10 days from the publishing notification.